After an academic conference on the Gold Coast, we drove Clyde the Wonder Van up the entire Queensland coast, all the way to where the paved road ends at Cape Tribulation. Queensland is a very cool, eh, make that hot, place. We showed up in the rainy season, so it poured every day. We started on the Gold Coast, a real fancy resort area just south of Brisbane at the bottom of Queensland. 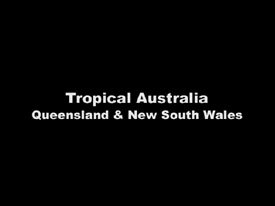 Then we drove north, through Brisbane, the Sunshine Coast, Rockhampton, Mackay, Townsville, and stopped in Port Douglas, which we used as our base. From Port Douglas, we spent a day snorkeling around the Great Barrier Reef and another day and a half exploring the Daintree Rainforest Park. Even though we followed the road straight up the coast, there were areas that were extremely dry, particularly around Townsville. and truk get close to some native animals. Title frame of the movie. Just in case you forgot what you were doing. 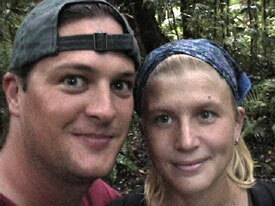 Autophoto of Kath and truk in the Mossman Gorge, walking through the rainforest there. truk prowling around on the rocks at Nambucca Heads. It was raining, and the white behind him is foam from the breaking Pacific Ocean waves. The rainforest at the base of Mt. 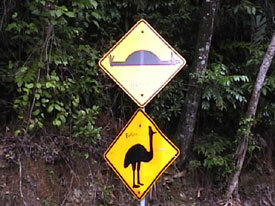 Warning, in the north of New South Wales, right below Queensland. Usually, there aren't rainforests in this area, but thanks to the volcano's old peak, a lot of rain falls directly around the mountain. Combined with the tropical heat, a vibrant rainforest has continued to exist there for a long time. Kath in the Mt. Warning rainforest. Most of Australia was originally covered in rainforests. When Captain Cook landed in 1770, only 1% of the continent was covered in rainforest, thanks to the Ice Age and droughts. Now, only 1/3rd of 1% remains, due to logging. 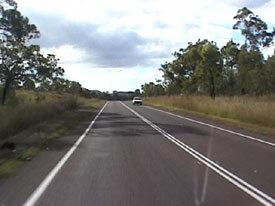 On the road, heading north to Townsville from Brisbane. We got to see this seen a lot, since entire trip put 6500 kilometers on Clyde the Wonder Van. We guess that we spent about 70 hours driving on the trip. 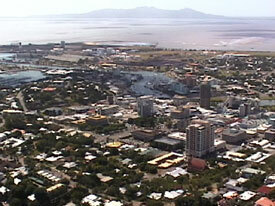 Looking down from Castle Hill on the port of Townsville. We stopped to sleep in Townsville on our way north to Port Douglas. Before leaving town, we went to the top of Castle Hill, this big mountain in the middle of town, to check out the view. 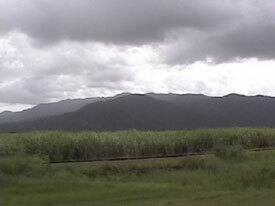 We also got our share of this scene: cane fields and rain clouds. The entire coast of Queensland is covered in sugarcane fields. It rained just about every day of our trip, at least for an hour or two. Rainy season. Kath at the edge of the Mossman River. 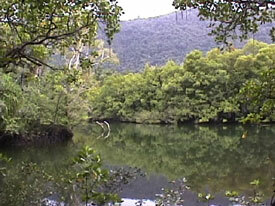 North of Port Douglas, before you get to the Daintree River, the Mossman River flows east into the ocean. This entire area is full of crocs, so you really have to watch out when near the water. 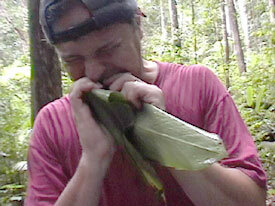 truk trying to eat a leaf that supposedly gave off a ginger flavor to food wrapped in it when cooked. 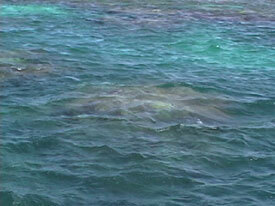 A very, very small portion of the Great Barrier Reef. The reef itself was nothing short of incredible. Breathtaking. So much so that they actually had to remind you to breathe before going down to snorkel: "It is just like watching television. Just relax, float, and breathe." Breakers hitting the reef with waves from beyond the continental shelf. 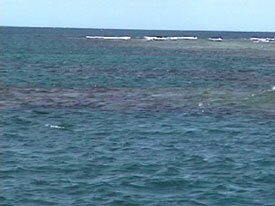 The reef causes all of the water between it and the shore to be relatively calm. The heavy waves from the open ocean slam into the reef, causing the strange effect of breakers stretching for miles in the open water. 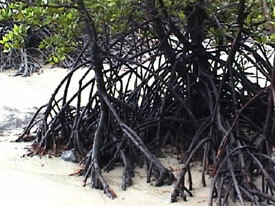 Roots of trees on the beach at Cape Tribulation. A mangrove forest touches the beach at the south end, and strange plants seem to spill out of the forest into the water there. 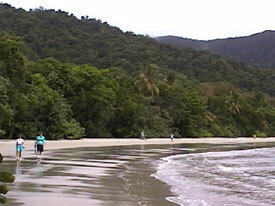 The beach at Cape Tribulation. We had to turn back from moving further north here because the paved road ended. 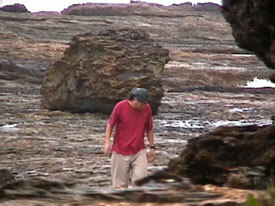 A horrible unsealed road continues up to Cooktown, but we couldn't risk Clyde's suspension. 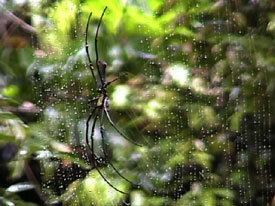 The spiders at Cape Trib were HUGE. 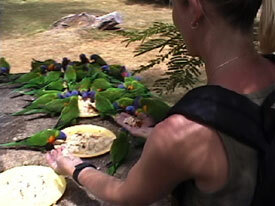 All along the rainforest walk near the beach, you could see them sitting and waiting for dinner to fly in. Some freak changed the top sign from a speed bump marker to a dead bird to give a Before and After effect. 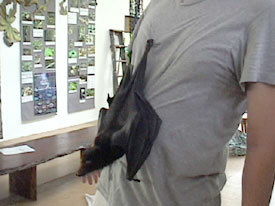 Annie the Flying Fox Bat climbing on truk. We stopped in at the Bat House near Cape Trib to find out about the bats, since we had seen so many at night all along the trip. 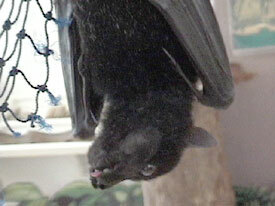 A close-up of Annie hanging upside down. Flying foxes only eat fruit, and Annie was enjoying the last of some apple in this shot. 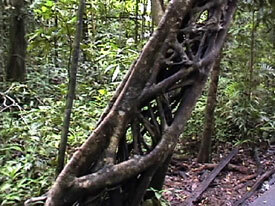 A crazy tree trunk in the Daintree rainforest. 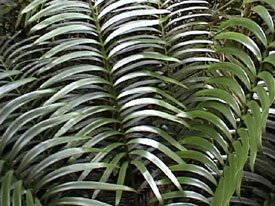 A lot of the plants in the Daintree are very ancient varieties, hundreds of millions of years old. You start to look over your shoulder for dinosaurs. 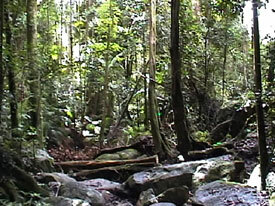 A river in the Daintree forest. 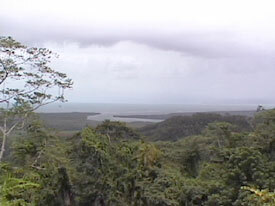 The mouth of the Daintree River as it spills into the Pacific Ocean. 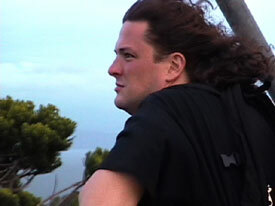 We were walking up the hill to an old WWII fort when this shot was taken. 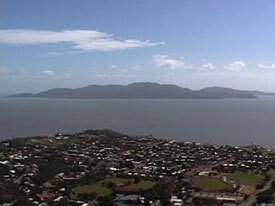 This is what Magnetic Island looks like when viewed from Townsville. The ferry over only takes 30 minutes, but it seems a world away from Townsville and the mainland. 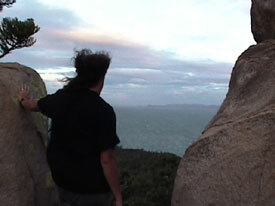 truk looks out from the fort at the top of Magnetic Island. The sunset from the top of the mountain on Magnetic Island is very beautiful. Unfortunately, we had a lot of clouds the night we make the hike. 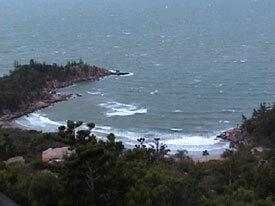 A hidden bay on Magnetic Island. Yes, Virginia, you can have a beach all to yourself there, if you want it. 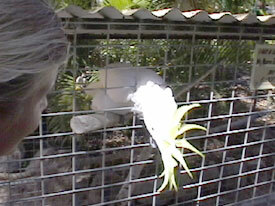 Kath feeds some parrots at the Koala Sanctuary on Magnetic Island. We stopped by the Koala Sanctuary to see the koalas, but they ended up having many more types of animals. They take in local wildlife that is injured or can't take care of itself. 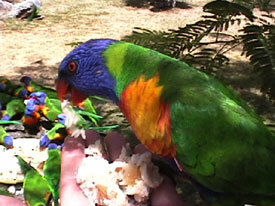 Close up of a parrot chowing down. 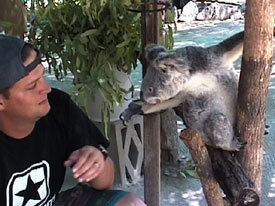 This koala really wanted to grab truk and climb all over him. 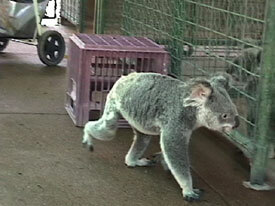 A koala strolling back to his cage. 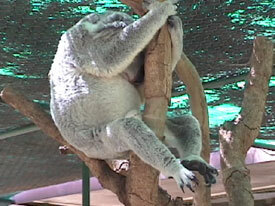 Koala dad taking a snooze. 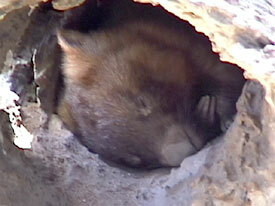 "Shake your head for us..."
A wombat sleeping in a hollow log. 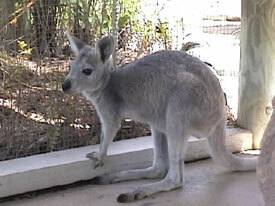 A baby kangaroo that Kath eventually got to eat right out of her hand. This little fella was scared of us at first.